Our expertise lies in designing and developing an outstanding range of Single Trolley Rotary Rack Ovens. Manufactured using high-grade basic material and latest methodology, these products conform to the defined parameters of the industry. Furthermore, these products can be used for multiple purposes like varnish painting, component testing, paint baking and many more. To cater to the divergent demands of the clients, we offer these products in various specifications. We hold all the aces in designing and developing the finest Single Trolley Rotary Rack Oven. These products are designed and manufactured using the best quality of raw materials and non-corrosive steel, under the strict and proficient supervision of our professionals. Designed to perfection, these dustbins are in compliance with the prevailing markets trends and clients' requirement. Our organization commitment towards quality enables us to offer the best Single Trolley Rotary Rack Oven. These products are designed with utmost precision by a set of skill handed professionals using the finest quality of raw material available in the market. Furthermore, in order to meet varied demands of the customers, we provide these ovens in different designs that can be customized as per the requirement. We have in stores Single Rotary Rack Oven for our esteemed clients. These products can be used for multiple uses like baking, heating and cooking. Designed to perfection, these products are constructed using superior quality raw material and stainless steel, plus we have a set of experienced professionals working behind the product, making it remarkable. Furthermore, our products can be availed in varied specifications as per the requirements of our valued clients. 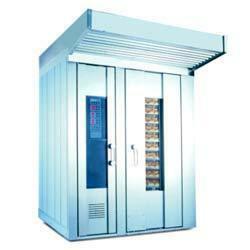 Our valued clients can avail from us the best-in-class Single Trolley Rotary Rack Oven. These products are manufactured using high-grade stainless steel and other materials supplied by our most trusted and reliable vendors. These products are used for cooking, baking, heating and other purposes. These stripes are precisely designed keeping in mind the divergent demands of our valued clients. Our expertise lies in designing and developing perfect Single Trolley Rotary Rack Oven. Designed and constructed by expert professionals, these offered products are efficient and require less maintenance and has long service life. These products are made from the finest quality of raw material and steel available in the market, which ensures better functionality of the product. Further, keeping in mind diversified demands of the clients, we offer this product in various specifications. Looking for Single Trolley Rotary Rack Ovens ?